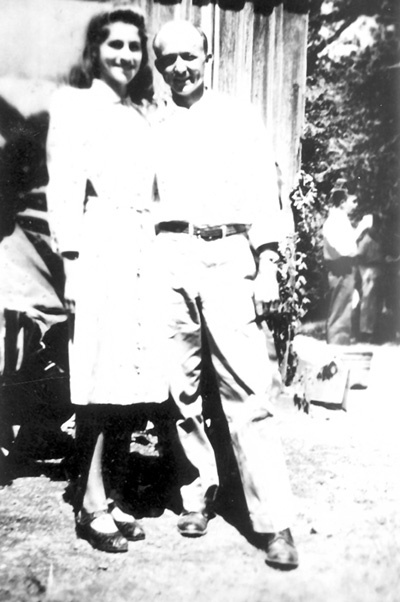 Gladys Hall and Bethel Theodore Smith, probably about the time they wed on 12 September 1947. She was 16 and he was 23. This website is devoted to ancestors of Bethel Theodore Smith and Gladys Hall of Bartow and Floyd Counties, Georgia. As is customary, I have avoided including any information on living persons. I call this site a “nexus” because it is the central site in a series of websites devoted to this family. There’s just too much information to put on one site, and even five is a little cramped. This project is the result of over 2-1/2-years and about 2,500 hours of research into the family tree. First of all, let me state that I know the websites contain errors, and in some cases I have lost the sources. If anyone has corrections, or new information, please contact me through the blog on this site or at upmytree@inbox.com. Second, let me make a shameless appeal for contributions toward the development and maintenance of these websites. I am unemployed and in ill-health, so any donations are welcome. Just click on the “Donate” buttom at the bottom of this page. – Gladys and Thiddo Smith. – Gladys's father and mother, Robert Jasper Hall and Pearl Grace Buttrum. – The brothers and sisters of Robert Jasper Hall. – Robert Jasper Hall's parents, Newton Jasper Hall and Anna Rosinda Gipson. – Newton Jasper Hall's family, including his parents James Madison Hall and Susannah Hall, their children, and his parents Seaborn Hall and Nancy Smith. – Anna Rosinda Gipson's parents William Asa Gipson and Mary Hickman, and their ancestors. – Thiddo's father and mother, James Henry Smith and Rosa Alice Davis. – Family stories, including my favorite stories about Robert Jasper Hall. – His mother Rosa Alice Davis's parents, Newton Berry Davis and Mary Elizabeth Marsh of Wayne County, Kentucky and their ancestors. – His grandparents William Thomas Smith and Harriet Octavia Brownlow of Kingston, Georgia, and their children. – Harriet Octavia's parents J. N. H. Brownlow and Jane Ann Austin of Polk County, Georgia, and their ancestors. – His great-grandparents Albert Smith and Ursula Collins of Bartow County, Georgia, and Albert's parents Jesse and Polly Smith of South Carolina and Bartow County. – Her parents, George W. Buttrum and Fannie Mae Carnes. – Fannie Mae Carnes’s parents, Elias Grady Carnes and Harriet Elizabeth Bagwell of Kingston, Georgia. – Elias's parents Andrew Jackson Carnes and Susan C. Silvey, and Andrew’s parents, Shem Carnes and Elizabeth Adams of Kingston, plus Susan Silvey's ancestors. – Harriet Elizabeth Bagwell's parents Joel David Bagwell and Harriett Susannah Caroline Nowlin of Rome, Georgia. –Harriet Nowlin's father Uriah Nowlin's and his ancestors, who can be traced to County Conway, Ireland in the 1500s. –Harriet Nowlin's great-grandfather, the infamous Uriah Humphries of Jackson and Clarke County, Georgia. – Photos of places and tombstones. – A summary of the information on the descendants of Jacob Collins and Mary Martin of Lincoln County, North Carolina. – An essay on “The Scared Corn-Ryo Murders” in 1865 involving members of the Collins family. – Plus photos, and a short video of Scarecorn Creek in Pickens County, Georgia. – Information on the family of Mary Martin, a line with its roots deep in English history, including Lady Jane Grey. – Unusual people in the family tree. There are some fascinating famous ones, such as the tragic English queen, Lady Jane Grey, but also some obscure, but no less fascinating ones such as The Staller Eadnoth, a constable in Stamford Bridge, Humberside, England in the middle of the 11th century. – Our family in wartime. This is an attempt to put together a comprehensive list of family members who participated in the various wars involving the Colonies or the United States. The list begins with the French and Indian War and the Revolutionary War, and includes many ancestors who fought, and in some cases died or were seriously injured in the Civil War. – Notes on the research, mostly birth pains, with some additional information on the Carney and Shugart families. – Notes on local geography. For those unfamiliar with the territory of Northwest Georgia, and for Northwest Georgians unfamiliar with certain counties in North Carolina, South Carolina, and Virginia, I have included some maps and notes. – Sources and resources. In the course of my research, I have come across some websites that proved invaluable and I pass them along here. I don’t view this project as my work alone. I have drawn upon the usual sources, such as census records and newspaper articles, but I have also scoured the web for information. When I began this project, I intended to put all the stuff I gathered together in a book just for the benefit of my immediate family, so, I didn’t worry too much about sources. And now, with the publication of these pages on the web, some sources have been lost. For that, I apologize, and will gladly include the proper attributions if notified. I see this project as an living organism, one that will evolve over time, and so I encourage contributions. I reiterate: if anyone has corrections, new information, or source citations for any of the information on these websites, please contact me at upmytree@inbox.com. If, for any reason, the donate link does not work, contact me at upmytree@inbox.com. Thanks. The following is a list of ancestors. I put it here for the benefit of those investigating this site, and to better enable Internet search engines to find this page. This site was last updated 26 October 2011.